Routine calibration and maintenance of sensors and probes: Technical staff visit the monitoring stations, verify operation of instruments, and replace probes as needed with freshly-calibrated units. Instantaneous sample and data collection: Water and sediment samples collected from the river are analyzed in the laboratory. Analytical results provide data for calibration of relationships among parameters measured continuously (e.g. turbidity) and pollutants of interest (e.g., total suspended sediment and suspended phosphorus. Measurements of instantaneous river discharge are used to calibrate so-called “rating curves” between stage level and discharge. Quality Assurance Program: Maintenance of data quality is a critical feature of the monitoring program. Our Quality Assurance Program ensures that data generated in the monitoring program are accurate, complete, and representative of actual riverine conditions. Station Maintenance: The permanent monitoring equipment at the stations requires maintenance to keep it performing properly. Examples of such maintenance activities include: replacing batteries and desiccant in instrument enclosures, flushing sediment from pipes in wells that are part of the river stage measurement system, preparing equipment for winter conditions, and clearing debris accumulations from probe booms that are suspended from bridges. Unfortunately, equipment at the monitoring stations is occasionally damaged by vandals, which requires repair. Data and Computer System Maintenance: The monitoring program relies on a network of computer systems that collect and store the data and maintain the project web site pages. Dependable performance of these computers requires regular maintenance and attention. 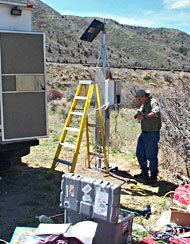 Jim Brock installing the instrument tower at Topaz. 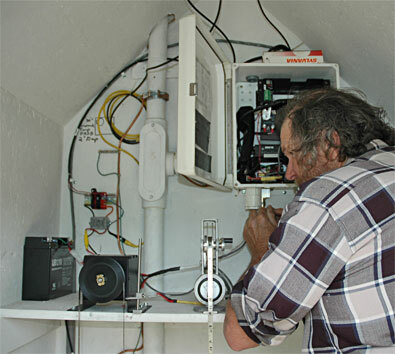 Allan Priddy performing maintenance in the gage house at Lower Marsh Creek.